Few people can have received public notices during their lifetimes from figures as disparate as Vladimir Ilyich Lenin and the Rev Alexander Gordon. But Victor Grayson did. David Clark’s new book Victor Grayson The Man and the Mystery (essentially an expansion of his earlier work Victor Grayson Labour’s Lost Leader first published in 1985) uses this observation made by Lenin, which – with the benefit of hindsight – may be an accurate summary of Victor Grayson’s early political career. The April 2017 issue of the Transactions of the Unitarian Historical Society will include a review article of David Clark’s book. It is a fascinating and unique story – a student for the Unitarian ministry with his roots in the North End Domestic Mission in Liverpool becomes converted to Socialism and finds a gift for oratory. At the age of just 26 he is selected to fight the Liberal held constituency of Colne Valley during the 1907 by-election and carries all before him. But Grayson is also famous as the first MP to disappear in mysterious circumstances and his career followed so many strange twists and turns that he remains an object of some fascination. In the review article I have tried to do justice to David Clark’s book, the result on his part of many years of research, interviews and reflection. The subtitle of the new book – The Man and the Mystery – is an interesting contrast to its predecessor – Labour’s Lost Leader, both terms illustrating the two main areas in which Grayson’s story still remains important. But it is also worth asking, what was Grayson’s relationship to the Unitarian movement? It seems unlikely he would ever have developed his oratorical skills without his prior training at the Unitarian Home Missionary College. It also seems unlikely he would ever have become involved in politics if he hadn’t first joined the North End Domestic Mission in Liverpool. Like all the Unitarian Missions of this type it was an institution that was concerned about and involved with the problems of the urban poor. It is significant that Grayson left the evangelical mission to which his family belonged and which according to David Clark’s book seems to have been normative for the rest of his family – in later years his mother also appears to have attended the Methodist Central Mission. The late Ian Sellers wrote an excellent article in the Transactions (vol. 20 No.1, April 1991) on J.L. Haigh, Grayson’s minister and sponsor for the ministry and the author of Sir Galahad of the Slums. But it is clear from this new book that J.L. Haigh had a high opinion of Victor Grayson and encouraged him to enter the ministry. Despite not passing all his exams at Liverpool Alexander Gordon was impressed by his application in the multitude of subjects he had to cope with, including Greek and Latin. David Clark quotes a long entry from Alexander Gordon’s 1904 report which begins and ends with: “[He] impresses me very favourably…[I] have no hesitation in recommending him for this”. Although a student for three years at the Unitarian College events were to take him in a different direction. As a very radical Socialist who was excluded from the House of Commons on occasion by the Speaker, what was the reaction to his success amongst the Unitarian community? An examination of the Inquirer or Christian Life for this period might prove instructive, although one suspects that he probably moved out of the orbit of most Unitarian interest at this point. “…if the College authorities were quick to forget him, his departure may not in fact have been quite so acrimonious as has been assumed. On his part, he certainly thought enough of his alma mater to contribute £10 for the Jubilee appeal in 1911, rather more than most alumni”. Staff and students at the Unitarian Home Missionary College c.1904. Victor Grayson stands on the back row, second from right. Principal Alexander Gordon is seated in the centre of the front row. By 1911, it should be noted, he was already out of Parliament and living in some poverty. During the First World War a spell as a war reporter was followed by a career as an orator trying to drum up support for the war both in Britain and in Australia and New Zealand. After the war his activities become very murky until September 1920 when he disappears altogether. But the Unitarian side of his life, although an interesting side line, is a little removed from the main purpose of David Clark’s book. The review article (David Clark, Victor Grayson The Man and the Mystery. Quartet Books Limited. 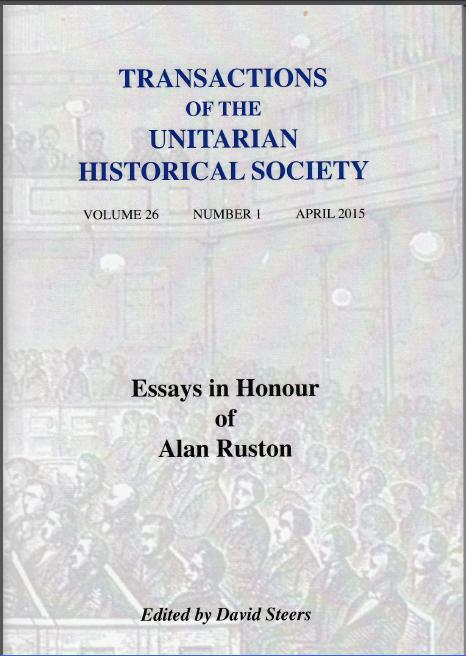 London 2016) will appear in the April 2017 Transactions of the Unitarian Historical Society.